by Brianna Crandall — June 18, 2018 — Maars Living Walls, an award-winning global designer and manufacturer of acoustic walls and doors, received a prestigious Best of NeoCon Silver award last week at the Neocon 2018 contract furnishings show in Chicago for its groundbreaking AXES product, steel-finish doors that pivot on axis points to become an acoustic wall system. We’re very pleased to receive a Best of NeoCon award! AXES is an elegant, minimalist solution that enables seamless transition from one space to another while also defining and creating the space itself. It’s the intersection between closed and open environments — dividing spaces will never be the same. Maars Living Walls previously received Best of NeoCon Gold awards for lineaCube and SQAPE, and Best of NeoCon Silver awards for the Acoustical Sliding Door and Panorama. AXES was developed with highly innovative and patented architectural standards, resulting in an access system with “invisible” doors, minimalist design and excellent acoustic performance. The so-called “revolutionary” system is well-suited for education, office, healthcare and other environments that require unimpeded access, the flexibility of both open and private spaces, and acoustic performance, says Maars. The company explains that AXES is the plural form of the word “axis.” In keeping with this plurality, AXES can be specified as a series of pivoting doors depending on need. 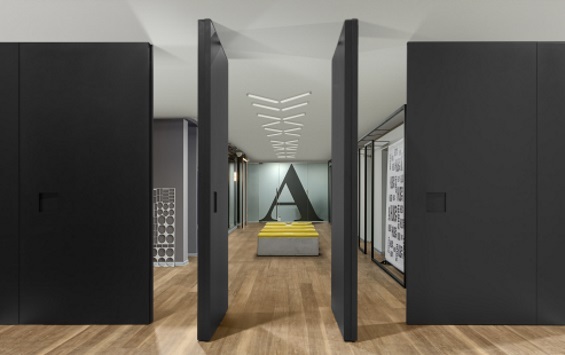 AXES is also a play on the word “access.” Because AXES doors pivot as opposed to slide, access between spaces is physically and visually seamless — unimpeded by tracks on the floor or ceiling. AXES is also ADA compliant. Developed by Maars’ research and development (R&D) team and third-party-lab tested, AXES’ patent-pending pivot construction offers three pre-defined positions for the doors, which let the user determine how the doors are placed and used — in other words, enabling an open, semi-private or private environment. 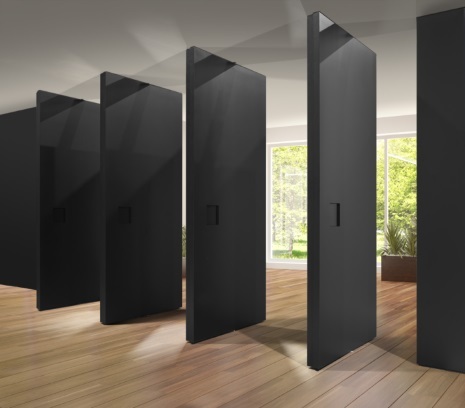 When fully closed, the AXES doors form a wall that provides an acoustic rating of up to 48 STC (Sound Transmission Class) as tested by an independent laboratory. An expert in acoustics, Maars specializes in STC performance and provides acoustic walls, sliding doors and related products around the world. Maars says it has developed more than 100 acoustic walls and door types that have been tested not only in its own lab but also tested and certified by independent laboratories. AXES answers the demand for spaces that need to be defined and transformed by the user. Although open-space environments have been trending for a number of years, we’ve seen more requirements for private spaces. AXES gives users the power to interact with and immediately change their environment depending on their need, which is critical to productivity. AXES is said to integrate well with SQAPE — the Best of NeoCon Gold award-winning steel architectural wall system introduced by Maars in 2017 — as well as with other award-winning Maars products. Each Maars system is a celebration of sublimity and minimalism where unnecessary lines and details are either hidden or eliminated. AXES is a relocatable architectural system that can be specified for new construction or existing spaces. AXES also can be an alternative to traditional dry wall, creating more design options for the built environment. AXES is made of environmentally friendly steel; the walls can help contribute to LEED, WELL and BREEAM standards. “We co-create with architects and designers to produce environments that inspire,” de Vries commented. For more information, visit the AXES page on the Maars Living Walls website. How can you reduce the carbon footprint of your next building project while still meeting performance criteria? December 10, 2018 In "Developments » Corporate and Organization"
Gain insights into today’s energy-saving, sustainability and space-usage trends from AIA’s 2018 library and education facility awards April 18, 2018 In "Developments » Industry Awards"
Find out how this new program will help you compare building products’ environmental impact and earn LEED v4 credits December 31, 2018 In "Associations and Organizations"
Collaborative project visualization technology and an acoustical wall — catch the latest DIRTT innovations June 27, 2018 In "Products and Services » Software & Technology"
How much do green buildings save in operating costs their 1st year? And which technologies improve building performance? November 21, 2018 In "Surveys and Trends"